Luxurious and beautiful vacation destination. Lakefront home on private Lake Pickerel in St. Germain, Wisconsin. Rent our brand new 2012 pontoon boat for a competitive $100 daily charge-minimum 3 day rental. Located on a lift next to our dock! Prime fishing, great dining, fabulous ice cream shoppe and many other outdoor activities including go-karting, golfing, horseback riding, shopping, biking, snowmobiling, walking/biking paths and much more. Also, an Indian casino only about 30-35 minutes away. Located a minute or so from the village of St. Germain and ideally located between Eagle River and Minocqua, Wisconsin - approximately 12 miles from each. The lakefront home includes many luxurious features such as: satellite LG- HD- 55 inch flatscreen TV, air conditioning, screened in porch, large deck overlooking Lake Pickerel, stone high-efficiency gas fireplace, a firepit and a 'wall of windows' that offers panoramic views of the scenery. The property offers dock access (seasonal and 3-5 minutes away at most) and guests are allowed to bring their own boat or other watercraft. We are now offering a new pontoon boat to our visitors at a competitive daily charge of $100 per day. A new lift has been added at our dock to accomodate this watercraft. For those of you that cannot part with your technical/electronic gadgets and computers, we now have wireless! A land line phone for making local calls as well as 911 is now in use. We have enjoyed Wisconsin 'getaways' for years while raising our family of 3 children who now are all adults. It's just great to take our 'mini-vacations' whenever we can and go to our lakehouse for a stress-free experience. We love fishing, having the ever-growing family come up and enjoy our freshly caught fish dinners. Of course, we could not skip eating out at Blink Bonnie's, stopping at Cathy's ice cream shop or having divine Italian dining at Spang's--all within just minutes from our private 'resort'. We love watching the Eagles, hummingbirds, woodpeckers, bluebirds, deer just to name a few of the wildlife creatures we have witnessed up here. We have actually spotted bear on 2 occasions over the years, but that is very rare. We also like the convenience of shopping the unique stores in Minocqua and Eagle River. And of course, the Indian casino is only 30-35 minutes away. Golfing is under 10 minutes from our lake home, including an awesome mini-golf for the children. Go-karting, horseback riding, tubing on the waters is only a few miles on 70 toward Eagle River. It's gorgeous in the fall with a wide array of beautiful colored trees and nice weather with craft shows and festivals. Winter is a new beginning for the snowmobilers and skiiers since we are in the middle of snowmobile country--Eagle River being the capital of snowmobiling. Hop on our lake to get on a trail or just down to 'J'. Trails are plentiful! But come back to Petry lake house and with a push of a button, you will have a cozy gas log enclosed fireplace heating our great room in a matter of minutes. All we can say is 'enjoy, enjoy, and enjoy'. Our promise is that you probably will not want to go back home when the time comes for your departure! It can be a' fantasy land- 'that is for certain for adults as well as children. It's far enough to call it the 'Northwoods'. We feel like we are 'getting away' with something by driving the 4 hours to come up here. We leave all of our stress back at home--it's kind of a 'cleansing' thing. lol You will know what we are talking about once you experience it. If you are like us, you will not want to go home on that final day! We love the fishing here, or just the soothing quiet with the sound of loon as we are drifting on the lake or sitting in our screened in porch, the shops, the eating, the peaceful, relaxing life, the many activities that we can do if we feel like it and on occasion the Indian casino! And it's just beautiful when the snows come. Snowmobiling is also quite a fun experience--we are only minutes from the snowmobile capital of the world---Eagle River! But when we arrive home, with a push of a button, our enclosed gas log fireplace pops on and heats the family room/great room in a matter of minutes. That's a good time to enjoy the satellite tv or our family collection of dvd movies we offer while cozying up on our leather pit group as well as the big leather recliner. 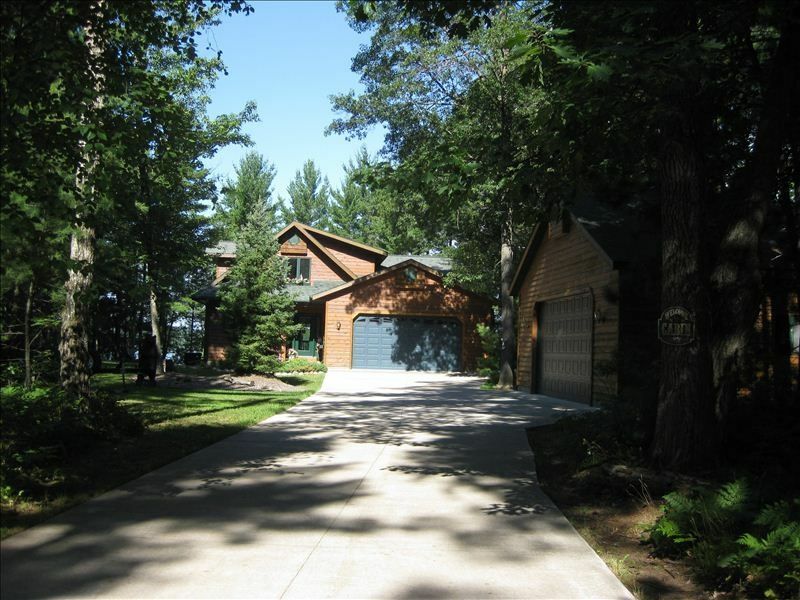 Petry lake house is secluded but yet not far from conveniences of life. That's what we like--the best of both worlds. One very important thing we neglected to mention is that on occasion we love bringing some of our good friends up so they can experience it as well. We enjoy 'sharing' our Northwoods'' home away from home' so that others may find the joy we do in getting away from it all. It's a great 'stress reliever' we have found. It has also been wonderful in doing alot of family 'bonding' with our family--children/grandchildren. Experiences we would not trade for the world. We hope you decide to experience it yourselves with Petry lake house! Walk down a short trail of stepping stones to our dock at our private lake's edge. You can water ski, jet ski, fish and some like to just get their feet wet! A land line phone is available for local calls and 911. Most of us all have our cell phones these days. We provide all sheets, blankets, pillowcases/pillows, bath and hand towels, washcloths, dish towels, and dish cloths. 2 car with garage door opener. An extra freezer is there for you to put your ice and/or freshly caught fish! We now offer wireless for 24/7 access! We offer our moose dish set along with all utensils imagineable along with spices, pots, pans, casserole dishes, toaster, coffeemaker--just help yourself. We have a large kitchen island with bar stools as well as a beautiful solid heavy wood table which seats 6, but can seat up to 10-12 with our leaf extensions. There are extra card table chairs and another table/chair set in the loft also. We offer a new LG 55in. HD flatscreen with Directvl and DVD player. We also are still able to watch movies from a hundred or so vhs tapes we store at our lakehouse for your own choosing. There is also a set of headphones in case someone wishes to watch tv late while others want to sleep. That way there will be no sound for others to hear. Our deck is on the 2nd level facing our private lake. Enjoy grilling out there--sitting in chairs watching hummers fly in for our hummingbird feeders. One of our favorite rooms is our screened-in porch. With plenty of seating and a wonderful close view of the lake and wild life, it's the place to put your feet up, have a piece of homemade pie and a good book or just take a short nap while you breathe in that fresh lake air. Alot of good conversations begin in that porch! We have also added a new pontoon boat this year at a daily competitive rate of $100--a minimum of 3 days. It is located at our dock on a new lift. Up to 8 people are allowed on it. For cruising and/or fishing. The house was extremely clean and the owner was very accommodating. Would recommend this property! Great place for family to gather! The house was great! Very comfortable and beautiful views! Had an awesome time up north this year thanks in part to this wonderful house on Pickerel Lake. Owners were great to deal with. Always got back to us immediately. Only issue was the indoor temperature couldn't be changed. The thermostat was frozen at 73 degrees, a little warmer than we're are used to. Other than that it was a beautiful house a hope to stay there again in the future. Thank you for your review.. happy you had a great time! I wish you would have contacted me on the thermostat...I know the directions as to how to set it on the Honeywell is maybe a little complicated. I have spoken to the renters that arrived right after you to double check, and they said it was working fine for them.. no problems setting it higher or lower. We like it perfect for our renters’ trips to the “Northwoods”! Thanks again! Linda Petry..
We selected this well appointed lakefront home because of important comfort features not found in other rentals for the price and convenience. Three larger separate bedrooms with three full size bathrooms was a perfect fit for our over-the-hill aged group of five. Bedroom night stands in each bedroom were perfect for CPAP machines with accessible outlets. The carpeted stairway to the upper level provided easy access with wide staircase and handrail. The attached double car garage for guests with high overhanging door provided lots of room to unload and load our SUV while parked inside out of the rain, minimizing the distance to haul luggage and coolers. All very convenient. This newer and well maintained house is well appointed and has modern features built into the design, not a result of numerous ill-planned additions common with so many lakeside cabin rentals. The west-facing lake view from the cabin provided colorful sunsets while tall pine trees shaded the house from intense western sun. The screened porch was ideal for reading and lounging while hearing the breeze through the trees and watching boating activity on the lake from mosquito-free deck chairs and loungers. WIFI was an easy computer connection and DIRECTV provided a wide variety of channels for evening entertainment. The kitchen is well appointed and overhead lighting made it easy to fix meals and cleanup afterwards. Besides having all the comfort features of home in a relaxing environment with the smell of pines on a lake, the most significant feature of this rental is one you don't see unless you need it, and that's customer service. The owner, Linda, responded immediately and relentlessly when the provided router dropped the Internet signal from the moment I texted her to when it was ultimately restored by the provider. She cares about their property and cares about the satisfaction of her renters. I highly recommend this rental to others and although it is 2,000 miles from our home, I hope that we can stay here again for a longer time. A really nice lake property with all the amenities. Very clean, well done home. And owner very responsive in any requests. Strongly recommend the place for a north woods stay! We wanted to give a big “thank you” to your review as well as all the other renters that have taken the time to write one! We are so happy that everyone seems to enjoy their stay at our beloved lakehouse. We strive to create a little “paradise” for all of your vacations! We love it when many of you return over the years! We charge $125 per day--minimum of 3 day usage-plus the 0.55% WI tax. Ask me for details.